Martin Lewis was born in Castlemaine in 1881, and left Australia for San Francisco in 1900, never to return. Most of his career was spent in the United States of America, principally New York. He contributed two drawings to the 'Bulletin' while working and studying in Sydney between 1896 and 1900. The Gallery has two early pencil drawings by Lewis, 'A squatter's home' and 'Berry's Bay, Sydney', made while he was still in Sydney. Lewis began making prints in 1915, although he did not exhibit until 1926. 'Boss of the block' was produced in an initial edition of 200, as part of a project to benefit the Art Students League of New York Print Fund, in 1949. 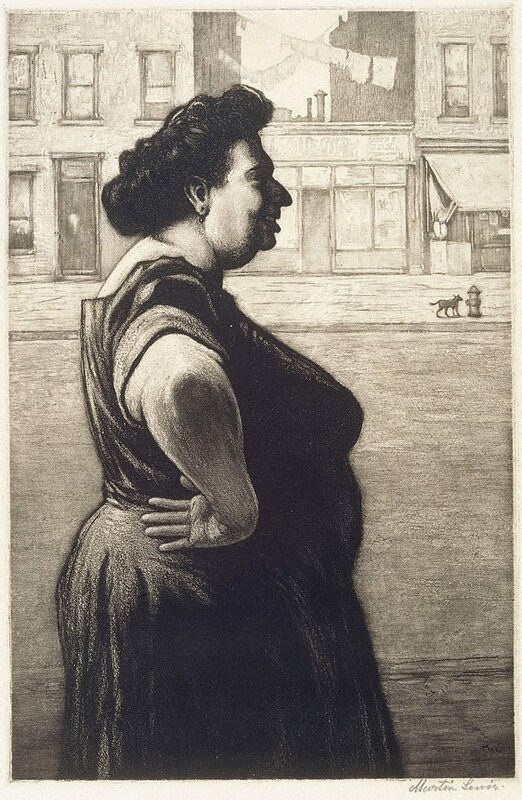 Ten instructors at the Art Students League (Lewis taught there from 1944 to 1951), made editions of 200 prints to be sold at five dollars each; other artists who participated included John Sloan and George Grosz. 212 impressions are recorded of this print. Its date is conjectural, based on its similarity to another print 'The Equilibrists' of 1939 (Paul McCarron, 'The prints of Martin Lewis, a catalogue raisonné', New York: M. Hausberg, 1995, (127)), although there are also stylistic similarities with a later print 'The wayfarer' of 1947 (Paul McCarron, 'The prints of Martin Lewis, a catalogue raisonné', New York: M. Hausberg, 1995, (135)). The cancelled plate is in a private collection in Indianapolis, USA. The Detroit Institute of Arts, Michigan USA, has a complete collection of the artist's prints, including plates, preparatory drawings, working proofs and archival material. Signed l.r., pencil "Martin Lewis". Signed with initials in plate to print l.r. corner, "ML". Not dated. Kirsten McKay, Martin Lewis: stepping into the light , Castlemaine, 2002, 34 (illus. ), 67.